The Guitar Column: Cool Guitar Website Alert | Arizona Guitar Brokers! Cool Guitar Website Alert | Arizona Guitar Brokers! I just received a comment from Jordan Warner on my Leon McAuliffe-owned Fender Broadcaster post. Jordan was the eBay seller of that vintage gem and now runs Arizona Guitar Brokers. 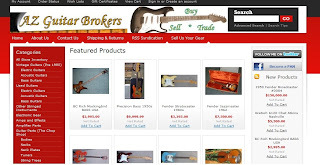 Arizona Guitar Brokers is currently featuring a Leon McAuliffe-owned Fender Precision bass along with some very nice vintage Fender Jazzmaster guitars from the 50's and '60s. The multiple picture views of each item in AZGB's inventory is a nice touch too. And dig that bird's-eye maple-topped BC Rich Mockingbird! Check out http://www.azguitarbrokers.com/ and check back often!